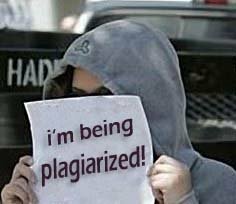 there has been a lot of talk lately about plagiarism. writers have to be very careful these days to ensure that their content is their own original material. why, just the other day i heard of a 19-year-old harvard student who wrote a chick-lit book that was pulled from the shelves before anyone could buy it because some of the passages in the novel were very similar to meg cabot's the princess diaries and megan mccafferty's sloppy firsts (or seconds, as it appears to be). well it's to be expected - chick lit has densely overpopulated target's bookshelves. and did you know there are at least 16 princess diaries books? how could you not at some point plagiarize? you have to practically make up a new language to not plagiarize from someone who has clearly cornered the market on girlish phrasing and descriptive passages about prep schools, lip gloss and tiaras. but on to the situation at hand. it was suggested not too long ago by a near and dear one that i might actually be guilty of THE literary no-no. it's true - i have been accused of plagiarising on my blog. i was just about write a post about something that has been weighing heavily on my mind when i got the shock of my life. i have been thinking about how weird it is that television networks seem to struggle knowing what a good sitcom looks like. oh, yes. i was all set to write a garrulously witty and v. humorous post all about the great vs. craptacular t.v. shows of 2005/2006, and wouldn't you know it? i did a google search for "my name is earl" and bam! there was my exact post masquerading as some msn tv news article! down to the last (almost) original word! someone has been plagiarizing my blog!